Likely at some point in early to mid 1960, Louis Zemel approached the Meriden parks department about building a ski area on West Peak. Assuming it was similar to other ski proposals made by Zemel that year (West Rock and Powder Hill), it would have likely included snowmaking and multiple rope tows. Overall, there was potential for over 600 vertical feet of skiing, which could have made it the second largest ski area in the state at that point. Zemel's proposed ski area was rejected by the parks department, as the park was deeded to not allow commercial operations. Zemel would co-found Powder Hill later in 1960.
" 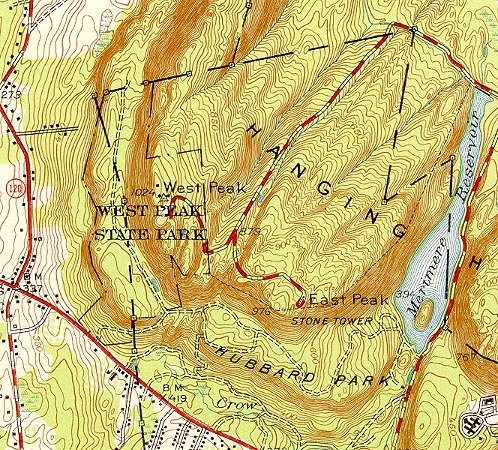 James Barry, superintendent of parks, reported that Zemel had sent a letter here asking about the possibility of constructing a ski run on West Peak. Zemel made the same proposition to Meriden which was turned down because of restrictions placed on the park. According to the deeds giving the land to the city the park cannot be used for commercial ventures, which the ski tow would have been. "